On June 15, 1985, a man attacked Rembrandt’s Danae by pouring sulphuric acid on the canvas and slashing at it with a knife. The painting was so badly damaged that it took the Hermitage Museum until 1997 to complete its restoration. This was neither the first, nor the last, time that an individual attacked a piece of art. Art is meant to evoke emotion in the viewer, but is it meant to create a physical reaction so strong that a person feels compelled to destroy or alter the work? Is the art to blame for these reactions, or is it just an outlet for an already disturbed mind? Let’s look at 5 other famous examples of art vandalism to see if any answers lie there. 1) But Venus wasn’t allowed to vote either: In 1914, a woman named Mary Richardson took a meat cleaver to The Rokeby Venus by Velazquez, which was on display in the National Gallery of London. This act of aggression was committed in protest of Emmeline Pankhurst’s (the leader of Britain’s suffragette movement) arrest. Richardson later described her reasoning for choosing the Venus: by destroying a painting that depicts the pinnacle of feminine beauty, she would call attention to the damage being done to ordinary women by the government in denying their right to vote. 3) Well, it was just a white painting: Apparently Ruth van Herpen thought “Please Don’t Touch” was just a suggestion when she planted a big, wet kiss on Jo Baer’s painting in 1974. She claimed the painting needed a little color to liven it up. 4) Um, Happy Birthday? : In a case of supremely twisted logic, Lazlo Toth, hopped the protections around Michelangelo’s Pieta and started swinging away at the Virgin Mary with a hammer. Apparently, Lazlo thought he was the son of God, that Mary wasn’t real, and that because it was his 33rd birthday he was ready to shed his mortal coil. 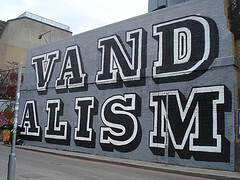 So, as we can see from these examples, art vandalism is neither easily predictable or preventable. Whether it’s political protest, general insanity, a bad reaction to an artwork, or a spontaneous need for some color, the reasoning is always a bit beyond comprehension. The need to deface a work of art is not defined by age, gender, political leanings, or nationality. It’s not always violent, and sometimes even people view their “additions” as art in themselves. On occasion, these reactions are immensely personal, while self-promotion sometimes serves as the motive. Finally, even the methods for destroying the art are not the same: one vandal event ate food of a specific color so that he could projectile vomit that color onto a painting. Why do people deface art? There is no one answer. Is art responsible for these reactions? In a way, yes. At the root of each of these cases lies art itself. Because of the importance we as a society give art, vandalizing artworks is an excellent way to get your message heard (even if it only makes sense to you). Is it wrong that people feel so compelled to interact with art? No, I would think most people have a desire to interact with art. However, I would like to believe that most people have a modicum of impulse control. First came the burning river, then the aquarium. Owned and operated by the Colonial Dames of America…now there is a group of women I would like to meet. Hey New Yorkers! If you’re looking for art with a side of spirituality, you should check out Sacrosanct at St. John’s Episcopal American Catholic Church (1610 Lexington, New York City). As far as exhibit space, a church that has been abandoned since 1990 seems like a fairly interesting venue. According to the show’s write-up, 10 artists were asked to “create, install, and perform pieces that respond to the sanctity of the environment.” One installation includes a modern-day “Last Supper” interpretation. Visit Sophie Lvoff’s site for more info and AnimalNY for photos. Better hurry, show closes June 21st. Um…well, I will take the safe bet and say: creationists?